BGR FAB: 15 Minutes With A Pro: Max Gremillion from Pull Pal on Must Have Tools For Beginners/Budget Fabricators. When we talk about metal fabrication, there are pretty much 3 ways of fusing metal. One is forging. Another is welding (in all the various forms that are out there). And the last category, would be mechanically, or chemically bonding the metal together. Therefore before we get into the first episode of "15 Minutes With A Pro", I want to just say that fusing metal together is extremely import to fabrication work. You will undoubtedly need to do this frequently. While Max Gremillion and I don't talk about welders in this episode of "15 Minutes With A Pro", this topic will be covered in a future episode in the near future. You may ask why we didn't cover that topic as a first episode then? Our reasons are simple. If you have a welder, but don't have a method of manipulating, cutting, repairing, or prepping the materials you need to weld on, having a welder is much less effective. Knowing this, we decided to cover what basic tools each hobbyist, DIY, or Beginner to the fabrication world should need. And believe me, we only cover the most basic of basic in this episode. Fifteen minutes starts to fly by. When you check out this episode, you'll hear some great tips on fabrication from someone who has a lot of experience. This will help you get started on you future fabrication projects with some of the most essential tools. We hope you enjoy the show! Max Gremillion and I (Eric McGrew), sit down to discuss a very important topic on this first episode of "15 Minutes With A Pro". 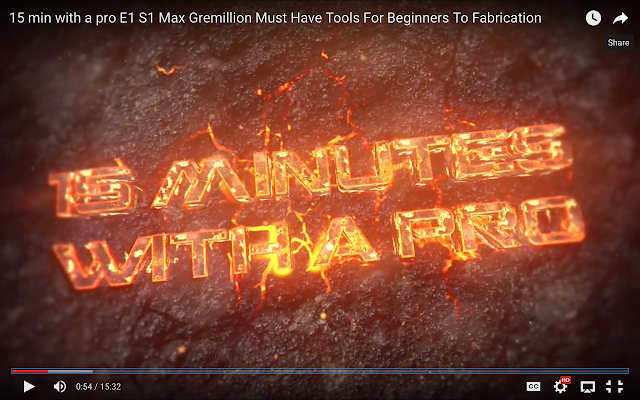 We talk about the, Must Have Tools For A Begginer to Budget Fabrication. So, why not sit back listen up, watch the show, and learn something useful, from a guy who knows?